mSensis had the honor to attend the 3rd Hellenic Forum for Science Technology and Innovation, held by the National Center for Scientific Research, “Demokritos”. mSensis successfully participated at the Digital Marketing Show 2015, held in Singapore, 22nd-23rd April 2015 which attracted a high number of visitors, coming from all around the world achieving an outstanding atmosphere. mSensis’ participation at the Mobile World Congress 2015 in Barcelona that took place the first week of March (2nd-5th), was proved to be an overall success in reaching the company’s key objectives. mSensis successfully participated in the leading global event of Mobile Money & Digital Payments that took place in Istanbul between the 19th-20th of November 2014.
mSensis showcased its mFinancials portfolio, with focus on banking and mobile payments solutions: Payment Gateway (Any Value Top-Up), mMoney, Cashback4u and mBanking. mSensis Société Anonyme of Applied Technologies, is pleased to announce that at the 440th/31.10.2014 Meeting of the Board of Directors of the Information Society S.A., the business plan-proposal entitled “Funzy Mobile Share Application” was approved upon a request with e-code “ICT-00670”, under the action of National Strategic Reference Framework of the Operational Programme “Digital Convergence” of Information Society S.A. “Business Support for the Implementation of Investment Projects for the development-provision of innovative products and value-added services” (ICT4GROWTH). mSensis company has successfully implemented and launched the official mobile application for Android & iOS for the 79th International Trade of Thessaloniki (TIF). mSensis is delighted to announce its participation as a Sponsor at the 39th Annual General Meeting of the Members of the Greek International Business Association (SEVE). 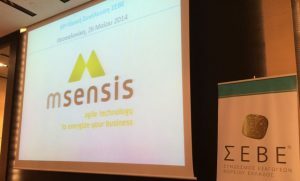 The Meeting took place on May 26th, 2014 at THE MET HOTEL, in Thessaloniki, Greece. mSensis participated as a sponsor to the 5th InfoCom CY 2013 with theme “Re-Power Cyprus: Digital Evolution & Business Continuity”. The conference run on Tuesday 12 of November and took place at Hilton Nicosia.